Spring is officially here and we can look forward the start of the outdoor events season. When exhibiting outdoors you need to plan and prepare for your event just as you would for an indoor show. The main difference will be the type of display equipment you use. You can take your standard exhibition equipment with you but most products, such as pop ups and pull up banners, are designed for indoor use only. So if you do use them outside you risk damaging them beyond repair, especially if the weather is inclement. For an outdoor exhibition or show it is best to have display equipment that is specifically designed for use outdoors. You can buy banner stands, flags and signs which are weather resistant and will withstand high wind speeds. If you exhibit at outdoor events regularly then it is worth having some outdoor displays in your exhibition kit portfolio. Many outdoor display products can also be used indoors so if you choose wisely you can have a product portfolio that will work indoors and out – ideal if your budget is tight but you need display equipment for both scenarios. Here at XL Displays we offer a wide range of outdoor displays suitable for all types of events and the Great British summer weather! 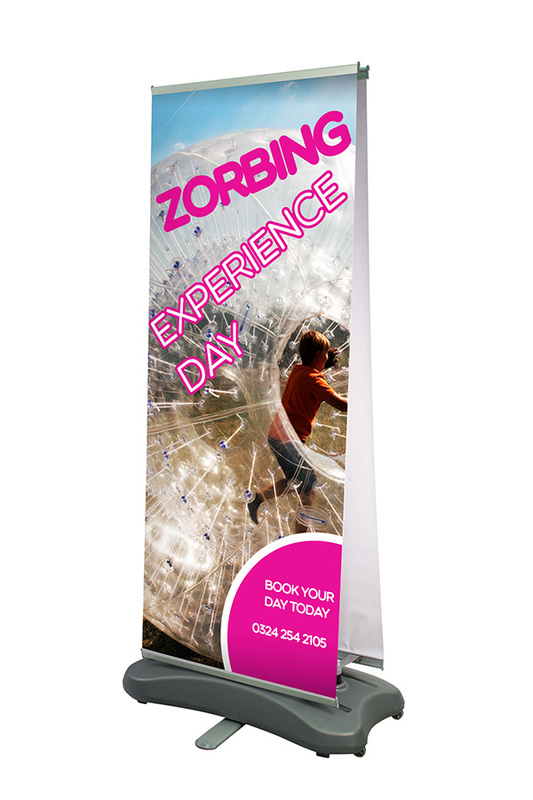 Our custom printed exhibition flags are suitable for all types of outdoors promotional events and are available in a wide range of shapes and sizes. Printed with your logo or artwork, flags are one of the most visual and striking ways to promote your business outdoors. Our popular Zoom Lite outdoor flags come in various shapes – straight, crest, feather and teardrop. All available in different heights and with a wide range of bases for any type of surface. We also offer the Mistral lamp post banners, available single sided or double sided. Perfect for promoting events or products in the streets of the city centre. The Zoom Grande is the largest of them all standing at a huge 5.8m high. Designed to grab the attention of anyone who comes across it and available in two shapes – feather or quill. We offer a wide range of outdoor banners which are designed specifically for outdoor use. Fully weather resistant and capable of withstanding high winds and adverse weather conditions, the outdoor banner collection offers a range of widths and heights so there is an outdoor display stand to suit your event. Suitable for use at all types of events, trade shows and outdoor promotions, whatever the weather, and available within 3-5 working days. Our outdoor exhibition stands include single sided and double sided pull up banners, such as the Thunder Banner, Cyclone Banner and Hurricane Banner. For something a little bit different why not try the Stowaway Banner? The stowaway is a pop up banner which comes in three sizes, it’s easy to use and lightweight – making it easy to store and transport. Pavement signs are a great way of promoting your business without breaking the bank. A cost-effective outdoor display solution which can prove to be very successful at drawing in passing customers. Our signs boards provide a professional display solution, ideal to use outside cafés, shops, restaurants and bars on the street, pavement or forecourt. All are available with or without print. A frame pavement signs are a popular and economical choice, with prices starting at just under £35. We offer A boards with silver or coloured frames and all options can come with full colour printed posters – perfect for promoting products or services. 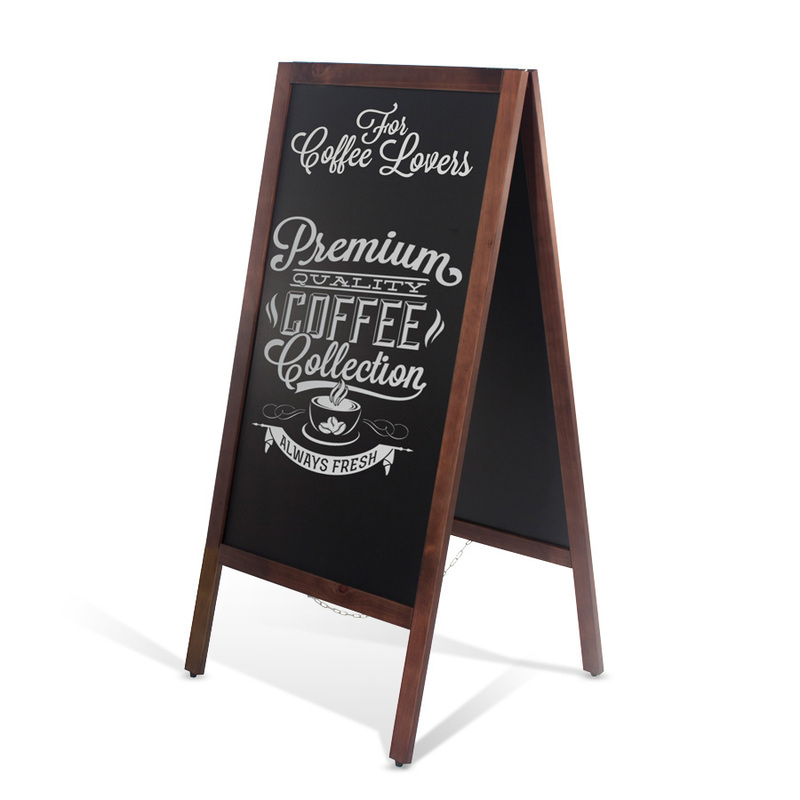 A very popular solution to outdoor promotion is a Wooden Chalkboard. Our chalk boards come with 4 liquid chalk pens included so you have everything you need to start promoting your business right away. 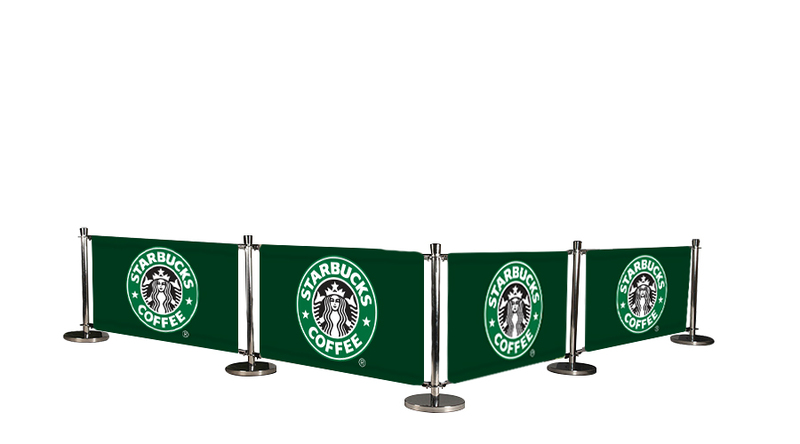 Our café barrier systems are perfect for extending your business outside and you can literally get your branding right out onto the street. Café barriers can be used to create designated outdoor eating or smoking areas for cafés, restaurants, coffee shops, bars and nightclubs. Not only do our café banners provide windbreaks for al fresco dining areas, they also extend your business outside and allow for extra table space. Outdoor dining becomes more popular during the warmer months and our café barrier systems allow you to attract that extra footfall. We offer café barrier kits in a range of sizes which provide everything you need to set up. Alternatively you can buy single components and tailor-make a café barrier to suit your outside space. The Cafe Barrier System Deluxe 4 Banners is a popular choice as it has all you need to begin promoting your business outside. It includes 5 posts with 4 printed banners and gives and overall length of over six metres. 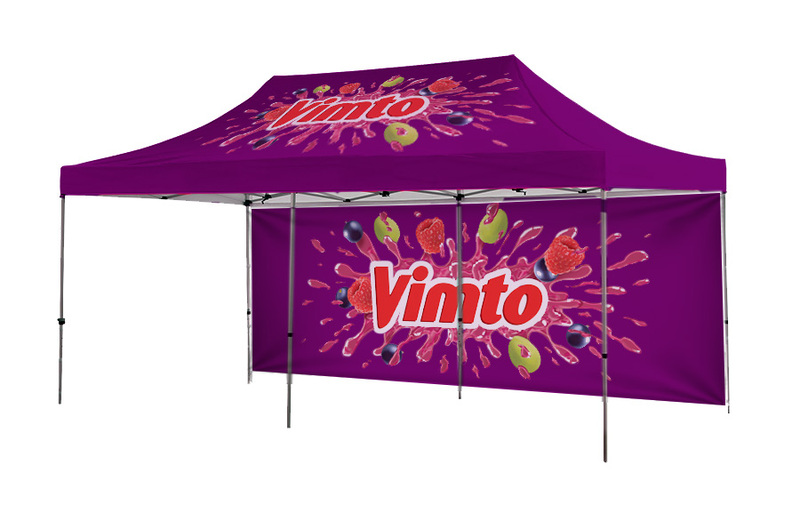 Our printed gazebos are perfect for making sure your brand stand out from the crowd at your next outdoor event. Fully customisable, you can print in full colour anywhere on the gazebo – canopy, back wall and side walls. Suitable for any outdoor promotional event, whatever the weather, as it provides a fully branded back drop as well as shelter from either sun or rain. Our Branded Gazebo with Printed Back Wall and 2 Full Side Walls provides an enclosed promotional tent which can be fully customised to suit your brand. Alternatively we offer a large gazebo with printed back wall and two side walls which covers a larger foot print. The X-GLOO Inflatable Event Tent is ideal for businesses looking to maximise their brand potential at indoor and outdoor exhibitions and corporate events. The ability to custom print different parts of the tent means it offers nearly limitless brand potential whilst providing a promotional display solution which is stable in any environment. 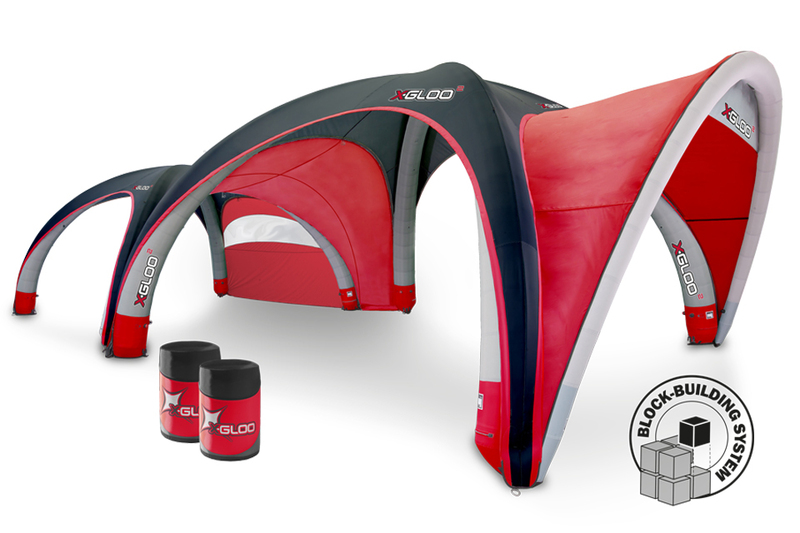 The X-GLOO couldn't be easier to set up, taking as little as 5 minutes when using an electric pump. The dome tent can also be anchored to any surface using our range of anchoring options. For more information on our outdoor display products and graphic design service please contact us or call our sales team on 01733 511030.